TYPICALLY, YOU WOULD relegate robotic and wireless technology to the realm of engineers and scientists. In most cases, you’d be correct. However, in the School of Social Work at The University of Texas at Arlington, groundbreaking and innovative interdisciplinary research has become a core part of the school’s identity. The key is collaboration, and social work professors—working closely with colleagues all over campus—have become pioneers in their creative approaches to addressing society’s pressing issues. Domestic violence is a pernicious issue that threatens the health and safety of one in four women and one in seven men in the U.S. every year. Researchers in the School of Social Work, in collaboration with researchers in the Colleges of Engineering, Education, and Science, are working toward a solution. Right now, the researchers are quantifying an individual’s awareness of their rising anger. Pinpointing the brain signals associated with anger could eventually lead to the development of a wearable device that detects when the brain waves associated with anger begin to increase. The device would signal to the wearer that an outburst is imminent, giving him or her the opportunity to exercise learned techniques to calm down or even leave the situation. Peter Lehmann, professor of social work, notes that mitigating instances of domestic violence could be extremely beneficial for society as a whole. Meet NAO, the robot that’s providing companionship to the elderly. Elsewhere, UTA’s social workers are engaging with various and wide-ranging departments on campus to help support aging and underserved populations. Noelle Fields and Ling Xu, both assistant professors in the School of Social Work, are collaborating with Julienne Greer, assistant professor of theatre arts, and UTA Research Institute research scientists Kris Doelling, Mike McNair, and Jeongsik Shin to help improve the psychological well-being of adults. 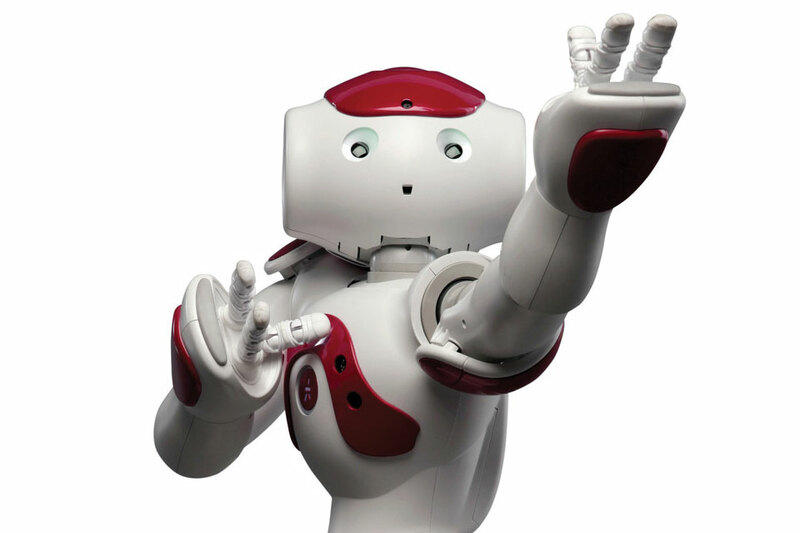 They’re doing so with the help of a 2-foot-tall robot named NAO that performs Shakespearean sonnets, tells stories, dances, and answers questions. The researchers believe interacting with NAO will allow older adults—who often suffer higher rates of loneliness, anxiety, and depression— to experience more social connectivity, thereby lessening feelings of isolation and mitigating depression. Another project aims to help the Urban Inter-Tribal Center of Texas to assess the needs of the American Indian population in North Texas. Maria Scannapieco, professor of social work; Paul Conrad, assistant professor of history; Barbara Raudonis, associate professor of nursing; and Kelly Visnak, associate University librarian, will create and conduct a needs assessment of the urban-based American Indian population of North Texas, where there is a virtual absence of scholarship on their medical, social, and cultural situation, despite general awareness of an urban Indian health care crisis. Both the NAO project and the partnership with the Urban Inter-Tribal Center of Texas received Interdisciplinary Research Program grants from UTA in 2016. The grants were awarded to proposals that reflected innovative ideas addressing high-priority issues in society. Each semester, the School of Social Work, through its Office of Field Education, places social work students with more than 600 agencies and organizations throughout Texas and across the country. This equates to more than 600,000 volunteer hours annually. Dr. Mitschke is also a part of the effort to volunteer and give back to the community. Since July 2012, she has volunteered every Sunday to manage a local nonprofit health clinic that provides low-cost physical and mental health care to resettled refugees from Myanmar. Mitschke manages social service and case management functions for the refugee clinic, which is housed in the Agape Clinic in East Dallas. In addition, she and Beverly Black, social work professor and Jillian Michelle Smith Professor in Family Violence Research, recently collaborated to address teen dating violence by educating resettled refugee youths in Dallas about healthy relationships. According to the National Alliance on Mental Illness, one in five children ages 13-18 has or will have a serious mental illness. Further, about 50 percent of students age 14 and older with a mental illness drop out of high school. To that end, UTA’s Center for Clinical Social Work has partnered with the Arlington Independent School District to provide counseling services for students who show signs of mental health disorders or issues. Advanced direct practice social work graduate student interns provide the counseling services. In another youth-focused initiative, Courtney Cronley, associate professor of social work; Larry Nelson, associate professor of kinesiology; and David Hopman, associate professor of landscape architecture, plan to design and test a project called GOE! (Gardening and Outdoor Engagement) that aims to increase the physical activity and improve the mental health of youths who are homeless and at high risk of negative mental, physical, and behavioral health outcomes. The long-term goal is to develop an evidence-based curriculum that could be replicated in other communities nationally. The project will use advanced data collection technologies already available in the School of Social Work and the Department of Kinesiology, and it will utilize UTA’s Urban Farm, sponsored by the Department of Planning and Landscape Architecture, as the test site. 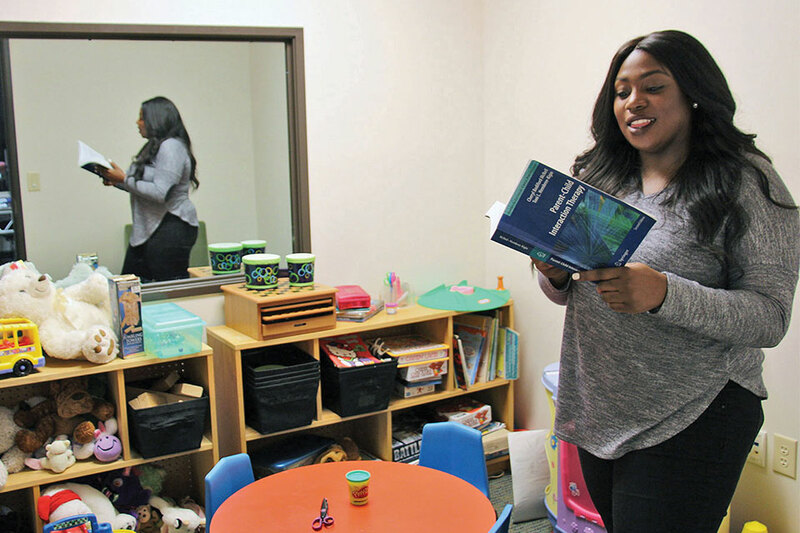 Daphene Woods, master’s student in social work, is an intern in the play therapy room of the Center for Clinical Social Work. In addition to faculty research, the school is home to two research centers: the Judith Granger Birmingham Center for Child Welfare (CCW) and the Center for Addiction and Recovery Studies (CARS). Established in 1983, the CCW serves as a research and resource center for Texas, the Southwest, and the nation in the advancement and dissemination of knowledge to improve the conditions of vulnerable children and their families. The school’s other center, CARS, provides evidence-based, trauma-informed services in prevention, intervention, and recovery support services for addiction. Founded in 1995 and located on the UT Southwestern Medical Center campus, CARS offers a unique program that helps pregnant mothers who are addicted to opioids. The School of Social Work’s approach to serving society through innovative research, collaboration, and strategic outreach is modeled by Scott Ryan, School of Social Work dean and Jenkins Garrett Professor. Dr. Ryan is a member of the Bikers Against Child Abuse International (BACA) nonprofit organization. Along with social work faculty Anne Nordberg and Michael Killian, Ryan partnered with BACA to conduct a research study examining the impact the bikers have on helping children and families. Founded in 1967, the School of Social Work owes its existence to community organizations that advocated and lobbied the Texas legislature to establish the school. The Community Council of Greater Dallas, the Dallas Council of Jewish Women, the Women’s Council of Dallas County and the Junior League were all involved in the lobbying process as early as 1956. Within a couple of years, the Tarrant County Community Council, the Rotary Club, Dallas County Child Welfare Division, Tarrant County Mental Health Association, Dallas Medical Board of Baylor University, and the Dallas chapter of the National Association of Social Workers joined the movement supporting the establishment of the school. According to social work Professor Emeritus James W. Callicut, who published a history book in 2008 about the first 40 years of the School of Work, the Community Council of Greater Dallas collected statistics in 1966 ranking Texas 42nd with the lowest number of social workers per 100,000 residents. At the time, there were only two social work schools in the state and neither were in North Texas. “Dallas and Fort Worth in 1967 had 550 recognized social work positions with only 130 filled-large-scale social programs under the rubric of President Lyndon Johnson’s Great Society and its War on Poverty drove the demand for trained social workers even higher,” Dr. Callicut wrote. According to Callicut, one of the School of Social Work’s founding faculty members and interim dean from 1977-78 and 1992-93, the Community Council of Greater Dallas led the charge and worked to involve community leaders and organizations to lobby elected officials and state legislators to appropriate funds to establish the school. As a result, legislation passed in May 1967, and the Texas legislature appropriated funds to establish a Graduate School of Social Work in Arlington. Now, 50 years later, social work professors and students continue to repay their gratitude, by supporting hundreds of community organizations and government agencies through research and student volunteers. The Community Council of Greater Dallas, the Dallas Council of Jewish Women, the Women’s Council of Dallas County, the Junior League, Tarrant County Community Council, the Rotary Club, Dallas County Child Welfare Division, Tarrant County Mental Health Association, Dallas Medical Board of Baylor University and the Dallas chapter of the National Association of Social Workers lobby to establish a school of social work in the Dallas/Fort Worth area. The Texas legislature appropriates funds to establish the Graduate School of Social Work in Arlington. Dr. Fernando Torgerson (retired Army Lt. Colonel) is appointed as the first dean. The school enrolls 26 students for the first semester in the Master of Social Work program (formerly Master of Science in Social Work). Faculty and staff moves into the Social Work Complex buildings located at Cooper and Abram. The school graduates the first class of 24 students. BSW and Ph.D. programs move to the newly named School of Social Work. The school starts a dual Ph.D. in international comparative social welfare with the Universidad Autónoma De Neuvo León in Monterray, Mexico, to provide the country its first social work Ph.D. program. Current dean, Scott Ryan, is appointed, and enrollment more than doubles under his tenure. The School of Social Work has more than 2,000 students and is ranked in the top 15 percent of social work schools in the nation.